Want to test your trading skills? 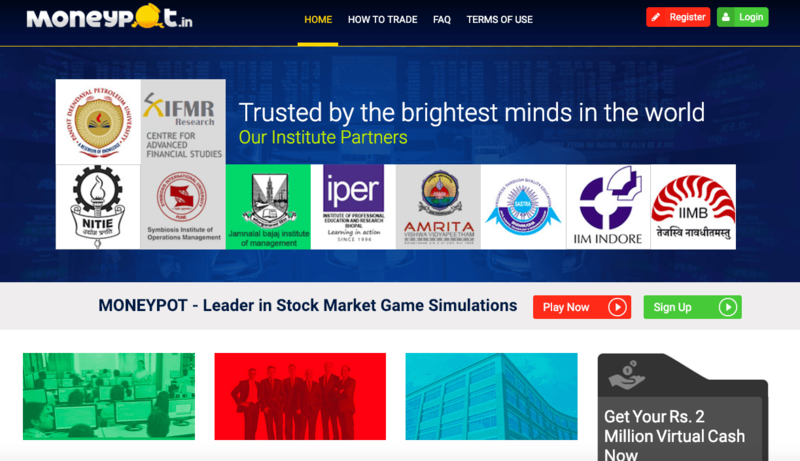 You can use any of the listed best Virtual stock trading simulators currently in India. Being an avid trader, these kind of simulated trades can hone your skills. When you are learning to trade, it is advised not to put your money in market in the beginning itself, but rather, paper trade for sometime. This is good idea. Always. It saves you a lot of money in the long run. But the question then asked is that paper trading may sound good in the beginning but it doesn’t provide the real experience of trading in stock market. And thus the success you get in paper trading is not replicated in real stock market. This is where stock market simulators come into the picture. A stock market simulator is a game like approach for trading, where you trade using virtual money on real stocks. It is a step up from maintaining the paper journal or excel journal that are not able to maintain with required details. A simulator helps you to have a feel of how the real stock market behaves and the profitability of your trading strategy. When you open an account with a stock simulator website, you are presented with a certain amount of virtual cash ( Rs. 2,00,000 or more) which you can use to buy/sell stocks in the simulated market. The prices shown are mostly from delayed feed and thus are quite close to reality. You get realistic idea about buying, selling and other mechanics of the stock market. You don’t need to maintain the trading journal to calculate your profit or loss of paper trading. It helps you to practice & improve your trading strategy without losing money. When used along with reading about trading strategies, these stock market simulators help in gaining the required experience and developing the necessary skills. To deal with volatility and uncertainty of stock market, you need a well tested trading strategy. This is basic requirement to make money from trading in stock market. Just like paper trading, as real money is not involved, the emotional factor is not trained for real trading. The real life scenario of slippage, brokerage, traded prices and other small details are not similar to real trading. With this in mind, here is the list of popular stock market simulation games which you can use to develop yourself as trader. This is by large the most popular virtual trading game for Indian market. Run by moneycontrol.com, the biggest site on market news, the game is let’s you trade in stocks, mutual funds, fixed deposits and bonds. You can invite your fellow traders, interact with other players and can participate in trading competition league. By large features of this game are good enough to train you well as stock trader. This game is joint effort creation of Bombay Stock Exchange and Dalal Street Investment Journal. And it shows. This is real time stock market game. As with moneybhai, you can create virtual portfolio in this game. Along with that, you can test out different strategies of trading the market. You can share your thoughts with other traders, on the platform itself. These features are good enough for a beginner. You can learn the basic of putting order, tracking your positions and using charts in much more practical way. Personally I have not tested this game. But it was sent to me by one of the trader’s in our telegram channel. It gives Rs. 2 Lakh as virtual cash to trade with. The amount is good enough to learn to trade. Give it a try and see if it suits your purpose. As trading involves real money from day one, it is good idea to learn and practice trading much before you put your money in stock market for trading. Playing in stock market simulator games, help you to understand how it works in real trading. You get to know the profitability of your trading strategy with real prices of the stock market. On top of that, there are many important things like managing your trades, stop losses etc. that you only learn when you apply them in the market. Though these platform and tools mentioned above don’t the real life experience like a real simulator should, they are as close to real trading than it can be.